None of the drawings of Taliesin I indicate any particular room for Anna Lloyd Wright, so I've never figured out where that information comes from, but it's prevalent. That's interesting... I can't remember where reading it, but recall that since in addition to the apartment in the studio wing, Wright also provided a separate entrance to a sitting room, bedroom, and bath contiguous with the main house. It certainly could have been a speculative assumption that his mother intended to take up residence. Considering her involvement obtaining the property (she was the buyer of record) and her connection to the valley, such a possibility wouldn't necessarily be a stretch. You're right though, there's nothing beyond speculation. Alofsin documents in "Wright Studies" the initial subterfuge of the house being intended for her, which could also contribute something (notation of a room for her would not be necessary when the original premise was that the entire house was being built for her). Most of the published drawings of a "completed" T1 were made after construction, and it was definitely built on the go using the few preliminary plans and sections known, but with Wright's direct supervision (like all of Taliesin that followed). Shame on me for giving factual credence if not deserved! 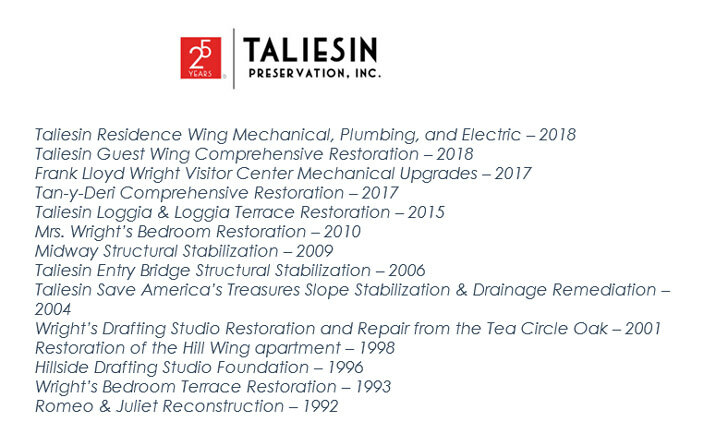 In a recent newsletter from the Taliesin Preservation, Inc. they include a chronological list of the restoration projects they've accomplished over the last few decades. Hoorah for those accomplishments ! It's an interesting list and we see that in 2018 they completed the "Guest Wing Comprehensive Restoration". I guess this means the downstairs guest rooms (?). Since they're done, I wish there would be some professional photography of those spaces that would be shared with the world.